I always enjoy reading about the way movie-makers have done things to fool the audience, especially before CGI enabled them to do nearly anything. In Humoresque, a pretty awful film with John Garfield and Joan Crawford, Garfield is a great violinist who plays on the screen a few times. You can see that the left hand on the strings isn’t his. It sneaks up from below the frame and in fact belongs to a real violinist, Isaac Stern. For a TV episode, I recently played a rich man murdered by a woman friend when he tells her he is going to change his will in order to disinherit her. So she picks up a heavy length of pipe and savagely beats my character over the head. As we rehearsed the scene, I was apprehensive. The plan was for her to be shown picking up the pipe and raising it behind me. Then a cardboard version of the pipe would be substituted, which she would actually batter me with. I asked the director and crew to be sure they were making the substitution when needed. They kept assuring me it was going as planned, but I knew things sometimes go wrong in filming—and of course I couldn’t see what was going on behind me—so I didn’t relax until I felt the cardboard actually hitting me on the head and shoulders. I haven’t seen the edited footage, but I’m assuming it will look authentic. 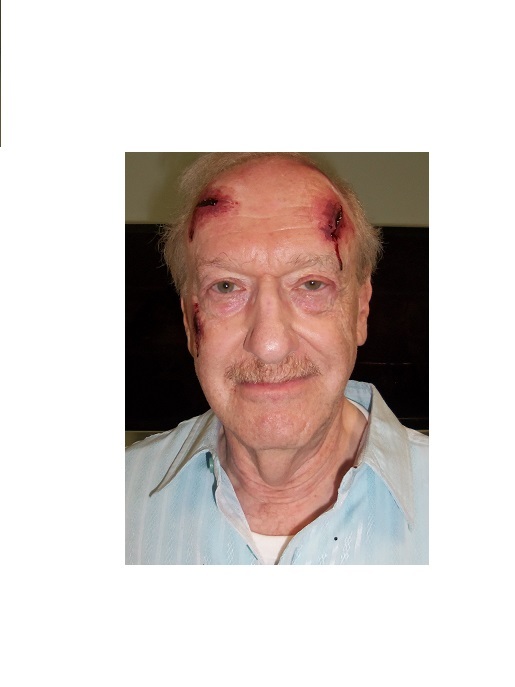 The photo shows the aftermath of the beating, although my character was dead in the actual scene.